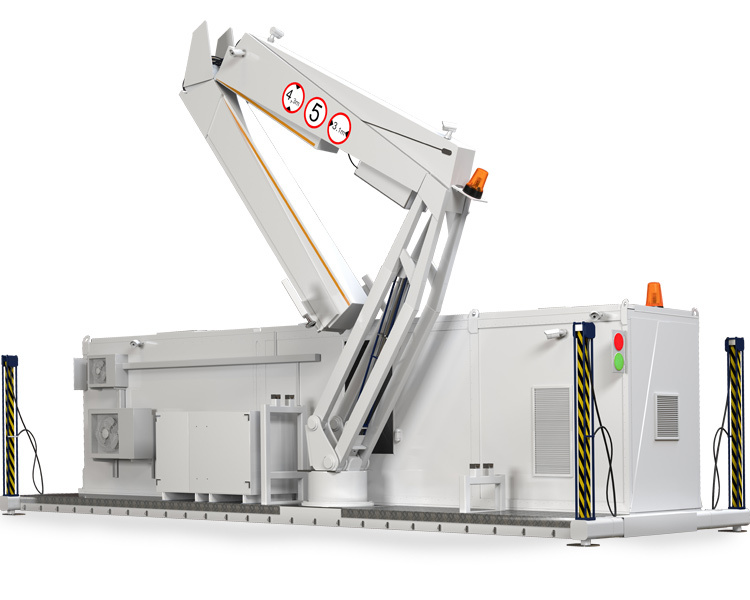 This X-ray vehicle inspection system is designed for scannng of fully loaded containers and trucks. It is a compact stand-alone and mobile X-ray scanning system, which can be easily deployed and transported by a standard container truck. DTP 5000LVR vehicle inspection system Its 100% mobility is perfectly suited for spot checks in most location. 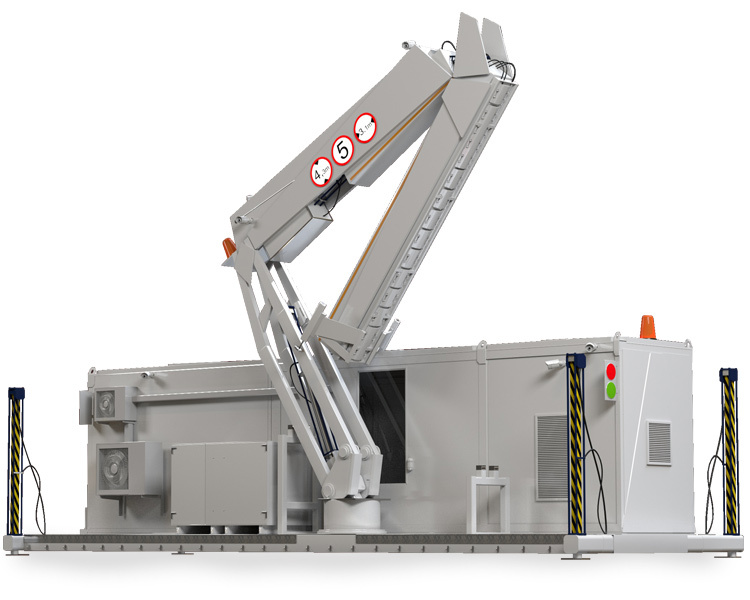 The DTP 5000LVR with 5 MeV-accelerator can penetrate up to 250 mm of steel and inspect up to 60 trucks per hour. The system can be deployed using a standard crew in less than 120 minutes. The electrical generator incorporated into the system allows its use without the need for local infrastructure. 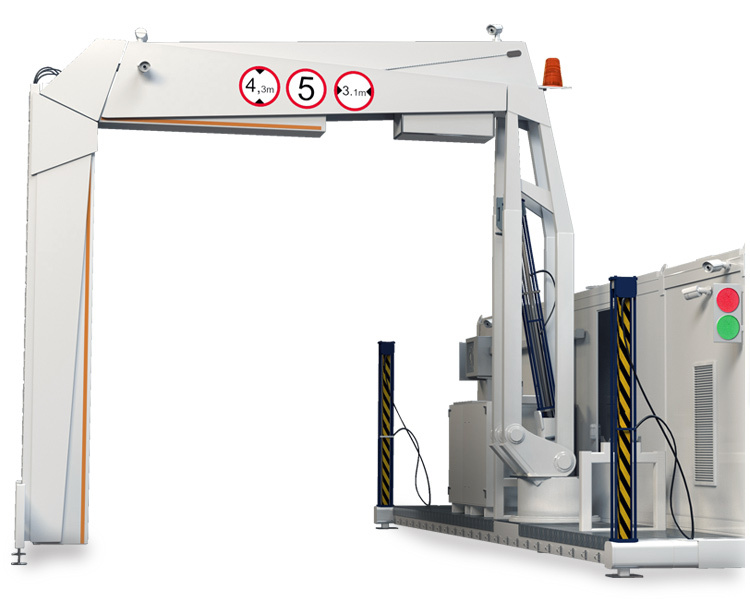 The system consists of a high-energy low-dose X-ray scanner with portal-shaped detection system for inspection of loaded vehicles (container or general cargo), designed with innovative “drive-thru” technology. It is specifically designed for inspection of containers and vehicles for identification of the cargo compliance to the transportation documents, detection of contraband, illegal drugs, weapon and other dangerous objects. This product is available for purchase or long/short term hire. Please complete the online enquiry form for the latest price and availability. Detectnology (UK) Ltd retain arguably the largest hire fleet of a complete array of people screening equipment classifications to which are extensively available for both short and long term rental applications. Our comprehensive stock holdings are available for ‘same-day’ dispatch accompanied with complete Technical Support & Advisory service, Delivery, Installation & Operator training facilities. Whether your requirement is just an archway metal detector or a fully comprehensive screening solution, Detectnology will ensure your environmental & application needs are fully supported with optimum levels of preventative screening devices to ensure any vulnerabilities or security concerns are overcome or eradicated. Detectnology specialise in Planned Preventative Maintenance programs, which are rolled out comprehensively to the country’s correctional and judicial sectors, logistical companies and distribution centres, stadiums/arenas, ports and government buildings. Whether your servicing provision preferences entail sporadic ‘adhoc’ attendances or are pre planned periodic intervals, Detectnology’s offerings are unrivalled and with reactive call out response times unavailable from other providers. Our renowned Technical Support & Field Engineering personnel are available to attend to any application on a national geographic coverage, enabling you to obtain within 4 hours, same day, next day, routine call out response time options & from receipt of instruction. Whilst we continue to invest in to human resources by appointing dedicated and competent field engineers to support our forever expansive contractual commitments, it is our main objective to ensure all of our valued customers' security screening asset management remain operational and fully functional 365 days per year.